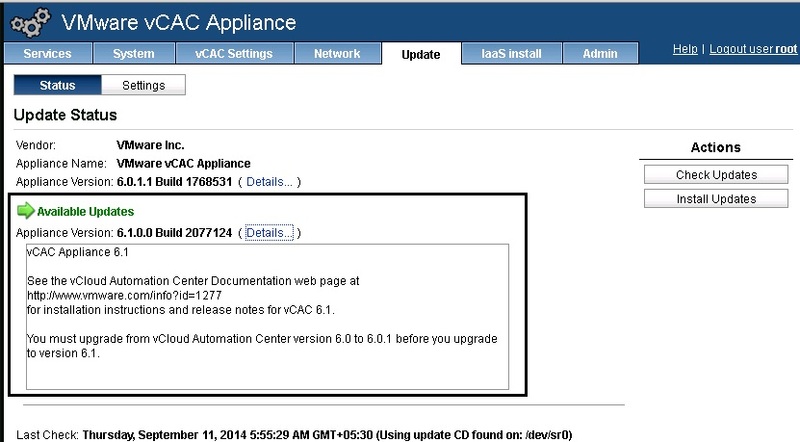 vRealize Automation 6.1 (formerly known as vCAC) was released this week with lot of new changes and bug fixes. This has been a major release after the update 6.0.1. I will not go into the details of all the changes and fixes but if you are interested there is a really good article by Omer Kushmaro on his blog. 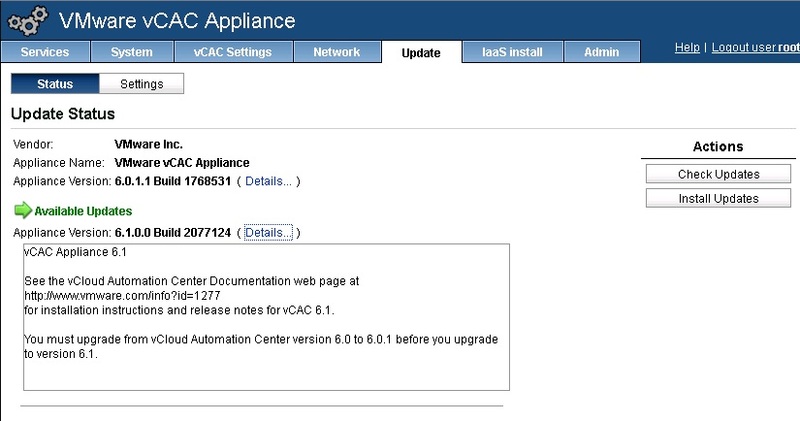 In this blog post we will see detailed step-by-step procedure involved in upgrading vCAC Appliance 6.0.1 to 6.1. We will see the steps for IaaS components in next blog post. This upgrade procedure is for a minimal installation environment where all the IaaS components are installed on a single windows server. 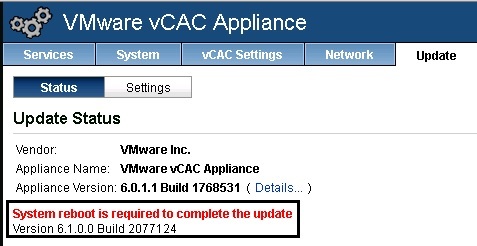 Upgrading identity appliance is not covered here as we are assuming vCAC is integrated with the vCenter SSO. Make sure you have backed up all the DBs and also take a snapshot of IaaS server so you can revert back if any issues occur. Make sure you are on 6.0.x version as you cannot directly upgrade 6.0 to 6.1. Now lets jump in and see how to upgrade vCAC Appliance. Login into vCAC Appliance @ URL https://:5480 using the root user. Click on the update tab. And then click on check updates button. If your appliance can talk to Internet, the available update will reflect and you can go ahead and install the update using the Install updates button. Now if the vCAC appliance does not talk to Internet There is a repo ISO file that is provided with vCAC download. So you can download it and mount it on the appliance and start updating. Now login into the appliance with root user and click on Update tab. Go to Settings and select the radio button that says Use CDROM Updates. Save the settings and move back to the status tab. Now that ISO is mounted, check for updates. Now that the update is available, click on Install updates. This will take a while. Sit back and relax till it completes. Once the update is completed, it will ask you to reboot the appliance. Go to System tab and reboot the appliance. Once the machine is back after reboot, login with root user and verify that update has completed successfully. This completes the vCAC Appliance upgrade. We will see how to upgrade the IaaS components in our next blog post.